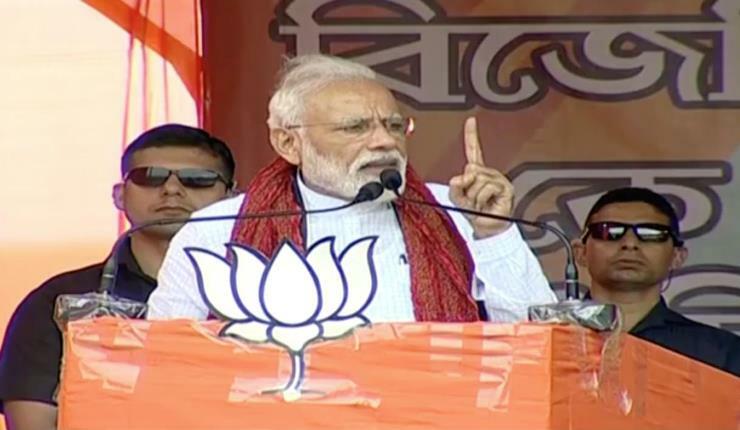 Cooch Behar: Prime Minister Narendra Modi on Sunday alleged that Chief Minister and Trinamool Congress (TMC) supremo Mamata Banerjee has betrayed the people of West Bengal. Addressing a public meeting here, he said Bengal was deprived of development due to Mamata’s government. Mr Modi took a jibe at Ms Banerjee and her alliance with the National Conference. “She is with those people who say that India should have two prime ministers,” referring J&K’s former chief minister Omar Abdullaha’s comment that J&K would again have a prime minister if he was voted to power. “The chants of ‘Modi, Modi’ give sleepless nights to ‘speed breaker’. Didi is the speed breaker of West Bengal,” he said. “The more you chant ‘Modi Modi’, the more someone loses their sleep. Do you know who they are? ‘Speed breaker’. The speed breaker of West Bengal - Didi. She is losing her sleep & is taking out her anger on her officers, on Election Commission,” the Prime Minister said.